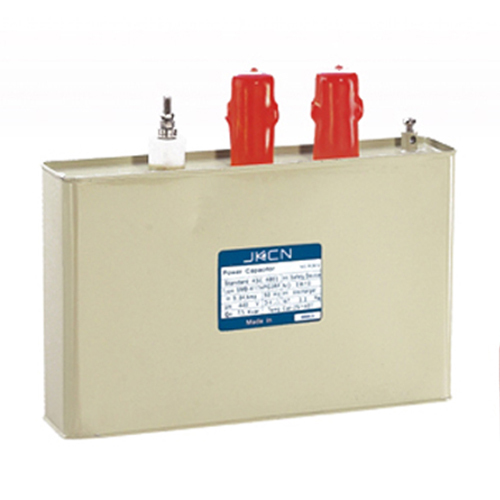 Brand of self-healing type low voltage shunt capacitor, made of the advanced metallized film, is produced strictly in accordance with the National Standard and IEC Standard by the introduced advanced foreign techniques and equipment. The device is mainly suitable for low voltage electric net work to improve power factor, reduce reactive loss, and better the voltage quality. 1.Service conditions: ambient temperature -25℃-45℃, humidity ≤85%, and altitude lower than 2000m. 2.Rated voltage: 250VAC, 400VAC, 525VAC, 690VAC,750VAC, 1050VAC. 5.Tangent of the loss angle: With the power frequency rated voltage, tg δ ≤0.1% at 20℃. 6.Withstand voltage: capable of withstanding 1. 75 times of rated voltage between poles for 10S, R≥1000M Ω. 7.Max allowable voltage: 1. 10 times of the rated voltage. 8. Max allowable current: 1.30 times of the rated current. 9. Self-discharging characteristics: Apply/2 Un DC voltage to the device and switch off the power supply for 3m, and then the residual voltage is 50V or less. 10.Standards: In conformity with GB 12747-1991, IEC 831-1988.